FOR about a week every March in the past decade or so, Clarastrasse in Basel, Switzerland, teems with journalists, big-name watchmakers and watch company executives. This is because the strasse — that’s German for “street” — runs smack into Messe Basel (including the old exhibition halls), current site of the Baselworld watch and jewelry fair. Going the other way, Clarastrasse leads into a narrower strasse which, in turn, makes its way toward the historic Mittlere Brucke — Middle Bridge — that spans the Rhine River, and to the old town centered on Marktplatz, around which watch stores and restaurants abound. But Clarastrasse itself is lined with cafes and stores, not to mention hotels and inns, so it’s quite a natural draw not just among Baselworld denizens, but also to tourists and locals. Halfway through this street sits John Tweed, a fine bicycle shop that is also so much more than that; it’s actually an attraction all its own, albeit catering to a certain set only. Because what this space actually is — it’s named for no one in particular, except to evoke an English theme — is a treasure trove of trimmings for the, well, tweedy. 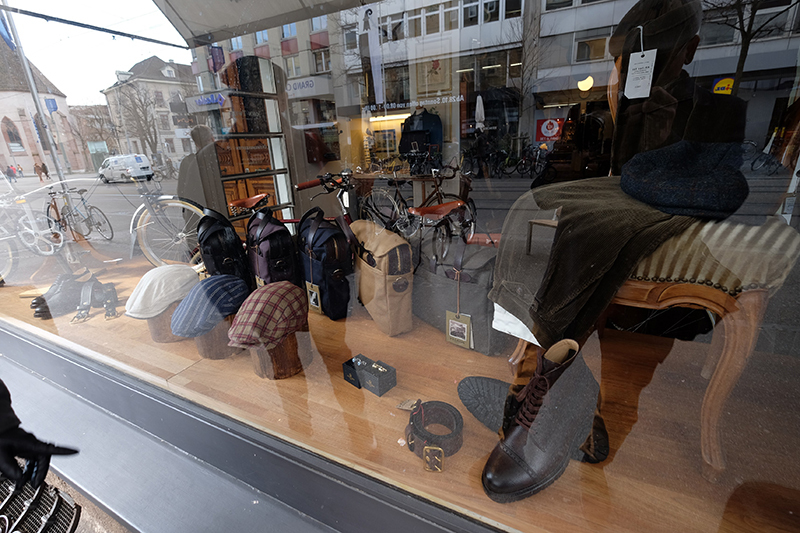 Its storefront window provides a taste of what finely crafted stuff lies behind its door. Slung on an armchair on the window shelf is a heavy woven coat. Littered around it are leather boots, brogues and belts, waxed-canvas briefcases and bags, and an assortment of flat caps — in tweed, of course. Enter the shop’s door, positioned perpendicularly to the sidewalk — it opens to the sound of clanging bells, announcing a visitor’s arrival — and one is greeted by a road bike replete with drop bars, steel frame, full-chrome fenders, Brooks saddle and all. Hung above it is a sport jacket, heavily textured, and which drapes over a plain-color shirt. A vintage camera with a leather case provides the perfect prop to the ensemble. 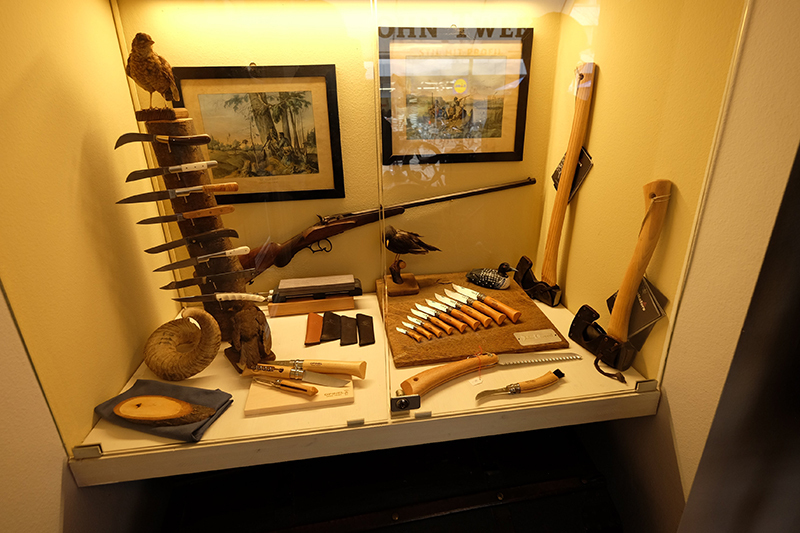 Displayed inside a glass cabinet beside it are sets of knives with wooden handles, a hunting rifle, axes and taxidermy bits. 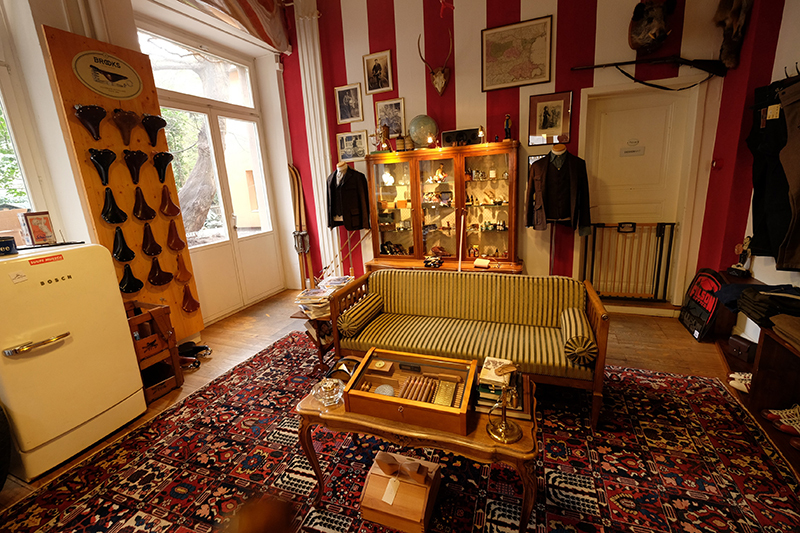 From this spot, it’s hard not to miss a couple more bicycles — and jackets and caps and other doodads — hanging on the wall, along with framed prints of European countryside scenes and some dandies. A leather armchair invites a guest to chill. Underfoot, a Persian rug mutes some of the footsteps on the wooden floor. At John Tweed, the atmosphere is redolent of old country charm rather than scented candles, as most men’s boutiques are wont to reek of. An assortment of jackets and coats, plaid and denim shirts, caps and hats hang on an open cabinet that crowds the narrow space connecting the front and back rooms. Once past this area, the space opens up to a sunlit “lounge” where a couch beckons; arrayed on the coffee table fronting it is a humidor. What a perfect spot for a smoke and a sip of whisky. Surrounding the couch are a glass cabinet full of leather wares, fountain pens and men’s accessories, more outdoorsy bags and duffels, and a vintage Bosch refrigerator. Bottles of whisky are perched atop some shelf or other. A hunting rifle, a vintage pair of skis, and antler horns add to the old country vibe of the place. Actually, in this store, it can be a bit hard to tell which among the varied objects hanging on the wall and cabinets, or sitting atop shelves and racks, are for sale and which are décor. 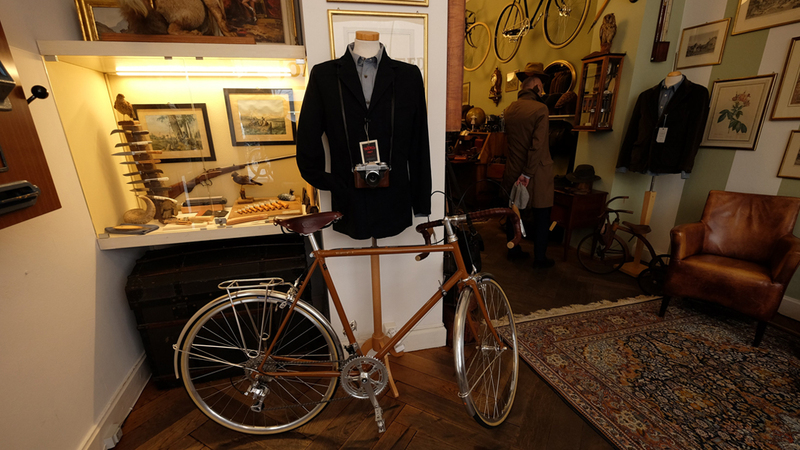 But make no mistake: John Tweed — it was opened in 2010 by Michel Seeliger, a Swiss — is a bicycle shop. The place is known for its rotating selection of vintage and classic bikes, usually restored, as well as some more modern ones. Basel, after all, is a city filled with people who prefer to pedal around as much as they drive or, more commonly, take the tram. So, lined alongside the artisanal crafts and apparel at John Tweed are cycle-centric produce. A section of the wall at the back of the store is devoted to leather-wrapped bicycle seats, arranged like the artwork they actually are. 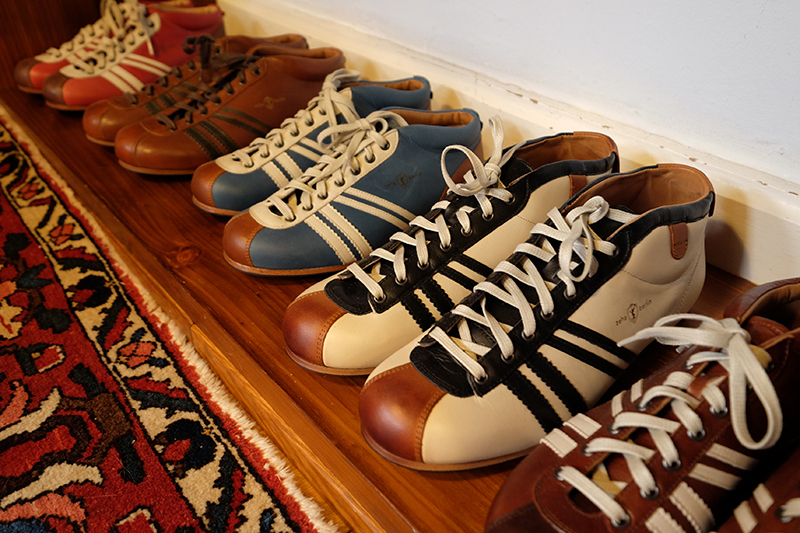 On a low cabinet, pairs and pairs of retro cycling shoes are kept in stock. Plus, the shop also repairs and services fine bicycles. Hard-to-get parts, like irregularly sized or white-wall tires, for some models long out of production can be sourced at the store, too. The sight, then, of a gentleman garbed in finely made heavy threads (unmistakably bought from John Tweed) visibly pleased on exiting the store with his haul for the day — a pair of small-diameter, skinny bicycle tires — is not uncommon in this place at all. And, actually, Clarastrasse is all the better because of scenes like this.